In his first address to a joint session of Congress in February 2009, President Barack Obama said that, by 2020, America should “once again have the highest proportion of college graduates in the world.” The White House and U.S. Department of Education indicated that the president’s goal would be met if 60% of 25- to 34-year-olds had completed at least an associate degree by 2020. Based on the conventional statistics used to gauge educational attainment, the nation has made some progress toward this 2020 goal during the Obama years. In March 2009, 41% of 25- to 34-year-olds had completed at least an associate degree. By March 2016, 48% of young adults had done so. Still, as Obama’s time in office nears its end, the U.S. remains 12 percentage points short of the goal. More progress will need to be made over the next four years than has been made over the past seven if the 2020 goal is to be reached. The U.S. also has a ways to go if it is to reach Obama’s stated goal of having the highest proportion of college graduates in the world. As of 2015, the nation ranked 10th among the 35 Organization for Economic Co-operation and Development (OECD) countries in college attainment, up from 15th in 2009. In 2015, 47% of U.S. 25- to 34-year-olds had at least an associate degree, exceeding the OECD average of 42%. But the U.S. still trailed nations like Korea, Japan and Canada by more than 10 percentage points. Men, women and all major racial and ethnic groups have made gains in college completion during Obama’s tenure. The magnitude of these increases varies between groups, however. Women continue to outpace men in terms of educational attainment, though both groups are making gains at a fairly similar rate. A larger share of female 25- to 34-year-olds (52%) had finished college in 2016 than their male counterparts (43%). 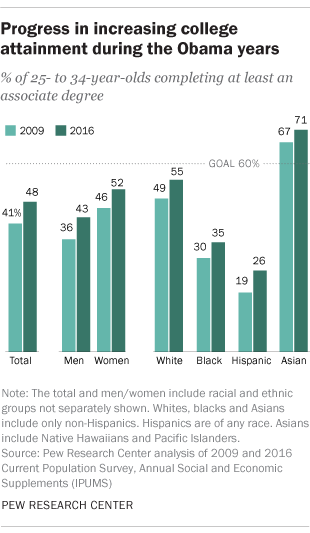 Asian Americans are the only major group to have met the 2020 goal, though they had already done so before Obama came into office. In 2016, 71% of Asian young adults had completed college, up from 67% in 2009. As of 2016, 55% of white 25- to 34-year-olds had attained at least an associate degree, compared with 35% of blacks and 26% of Hispanics. While young Hispanics are furthest from the 2020 goal, there are large gaps between U.S.-born and foreign-born Hispanics. U.S.-born Hispanics are twice as likely as their foreign-born counterparts to have completed at least an associate degree (34% vs. 17%). In fact, the attainment rate of young U.S.-born Hispanics is on par with that of young blacks (35%). It’s important to note that many young foreign-born Hispanics have recently arrived in the U.S. from countries with lower average levels of education than the U.S.
Conversely, young foreign-born Asians are more likely than their U.S.-born counterparts to have completed at least an associate degree. This is largely due to the fact that many of these young Asian immigrants hail from nations that have higher educational attainment levels than the U.S. overall.